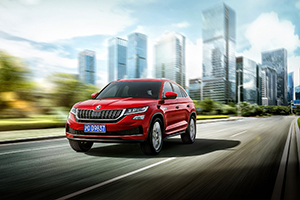 The ŠKODA Kodiaq GT is the Czech brand’s new flagship model in China. ŠKODA’s first SUV coupé, intended exclusively for the Chinese market, is the next milestone in the Czech manufacturer’s SUV campaign. With its strong, dynamic presence and state-of-the-art connectivity, the Kodiaq GT is the new standard bearer in ŠKODA’s most important sales market. China will be the only market in the world where ŠKODA offers a total of four SUV models: Kamiq, Karoq, Kodiaq and Kodiaq GT. For the first time in the SUV segment, ŠKODA is offering a vehicle that combines the robustness and versatility of an SUV with the sporty elegance and dynamism of a coupé with the Kodiaq GT, appealing to new, lifestyle-oriented consumer groups. The new Kodiaq GT celebrates its official premiere in China at the Guangzhou Motor Show, which takes place from 16 to 25 November 2018. Dr. Ralf Hanschen, President of ŠKODA China, says: "The ŠKODA Kodiaq GT is an important milestone in ŠKODA's China strategy. Being the first coupé SUV in our model range specifically designed for the Chinese market. We are confident that this sporty and stylish ŠKODA model will appeal to new customer groups and provide an even more impressive driving experience for our customers in China." The front of the 4.63-metre-long ŠKODA Kodiaq GT is characterised by a wide bonnet and black-framed grille with chrome-plated dual ribs. The LED headlights, three-dimensional bumper and front spoiler with wide air inlets reinforce its powerful appearance. The roofline gently sloping behind the front doors merging into the flat tailgate gives the Kodiaq GT a dynamic profile. Powerful wheel arches and chiselled side skirts in the body colour with matte black elements also add to the robustness of the coupé version of this large SUV. The rear end features sharply drawn LED taillights with crystalline shapes and ŠKODA's characteristic design. A fine reflective tape runs down the loading sill along the entire width of the vehicle and creates further accents alongside the black diffuser. In a display of confidence, this is the first ŠKODA production model in China to replace the roundel with the brand lettering in individual letters in the centre of the tailgate. The interior of the new Kodiaq GT is also sporty and stylish, combining the space typical of SUVs with the emotive lines of a coupé. In the interior, the eye is immediately drawn to the high-quality materials and fully customizable Virtual Cockpit, which comes as standard. As is typical for ŠKODA, there are numerous practical ‘Simply Clever’ ideas. With Wi-Fi access and MirrorLink™, Apple CarPlay and Baidu's Carlife, the Kodiaq GT is always online and at the cutting edge of connectivity. The range of drivetrains for the Kodiaq GT includes two efficient engines: a 2.0 TSI with 137 kW (186 hp) drives the front wheels; the 2.0 TSI with 162 kW (220 hp) comes standard with all-wheel drive and a 7- speed DSG. Numerous assistance systems including Blind Spot Detect, Front Assist and Adaptive Cruise Control (ACC) with stop-go function to ensure maximum safety. SUV models in particular play an important role in ŠKODA’s growth plans in China. In 2007, the Czech car manufacturer returned to the Chinese market, which became the brand’s largest sales market in 2010. In 2017, ŠKODA delivered 325,000 vehicles in China – one in every four ŠKODA’s delivered worldwide last year. According to a five-year plan, laid out in a Memorandum of Understanding signed in 2016 during Chinese President Xi Jinping’s state visit to the Czech Republic, more than two billion euros will be invested in the expansion of the SUV portfolio and the development of alternative-drive ŠKODA vehicles. id like some advice on the arsh end of my convertible. Droplinks were so cheap I'm going to try one tomorrow anyway. Just been looking at a vid on youtube and it looks easy so long as you have the filler adaptor about 15quid plus the oil. Audi TT mk3 seats in mk6 GTI? I’ve seen someone who fit S5 seats in a GLI. Very knowledgeable, very helpful and good customer service. Hi, I was also hoping for more information on this. How did you identify the correct wires to pair? Trial and error? I have a 2009 mkv GTI. Re: Audi A3 8P - 2011 Black edition 140bhp - Issues when Driving from cold. That is an interesting one, if ever you are passing this way I would be pleased to look at it but would want it overnight. REMOVE the bungs, did I say remove the bungs? have you?